All of us want vibrant healthy skin especially as we continue to age. Our whole well being becomes more of an importance to us. Not only do we recognize that, but we know the reality of expenses. I know I've looked at skincare items, and it says all of these enticing things. "It'll reduce wrinkles! reduce dark spots! brighten your skin! and you'll have that JLO glow in no time!!" In my mind I'm thinking YES YES I WANT ALL OF THAT! Then you look down at the price tag saying.... "and it'll only cost you a small amount of $100!" (😨 $100??) No Way! I tell myself I do not like to spend $100+ on skincare, even $50 is quite a stretch for me. I know I'm not the only one that has felt that way, and looks for more affordable options. Not that you don't care about your skin, but not everyone has $60 laying around. Though your skincare is an investment you can do it wisely and save your money! A brand named The Ordinary by Deciem launched August 30th, 2016 (why I took so long to buy it idk I'm skeptical person) This brand is nothing short of Extra-Ordinary it is cruelty-free,vegan, sulphate, and paraben free. It is a science-driven brand that uses clinically proven effective ingredients. They also use protective packaging for preservation on all of their items. The packaging comes in an innovative dropper form which helps prevent contamination and longevity.You might be wondering how can this actually be so cheap? Since they're formulated and production is done in-house they cut off retail markups! It sounds unbelievable but it's true! The items I have purchased vary from $6-$10. Yup! you heard that correctly $6-$10! no wonder beauty lovers are going crazy for this stuff. Here are listed items I've purchased tailored to my own skin type. Have in mind that my skin is oily, if you have another skin type The Ordinary helps you choose a treatment. Each skincare item also comes with stickers, and a regimen guide to help you apply them correctly. I can't even begin to tell you how important retinoids are for your skin! Retinoids reduce the signs of aging, reduces hyperpigmentation, brightens dark spots, and smoothes skins texture. Since I do have pimples from time to time I have texture on my skin. This has been a staple in smoothing and refining it out. The nice thing is that The Ordinary is the only brand I know that has affordable retinoid treatments. Across high end stores brands like Sunday Riley, Peter Thomas Roth, REN, and Murad carry retinoid products. The only problem is that they've marked them up ridiculously high! Why spend $80+ when you can get the same results for $10? When using retinoids make sure to use SPF because it can make your skin sensitive to the UV Rays. This is another treatment that helps to smooth skin texture. It is a high strength exfoliating serum that resurfaces the skin to give you a more supple appearance. This contains Tasmanian Pepperberry which is a botanical extract that reduces irritation. When using this serum make sure to apply it only at night with your routine. Make sure you also apply this before any creams, and allow for it to absorb completely into the skin. I am so thrilled to see The Ordinary's expansion as the brand continues to grow. They have a variety of skincare items tailored to everyone's skin concern which is essential. Right now they are expanding their makeup items besides their primers, and foundation. I heard the brand will be introducing highlighters into their collection which I'm totally on board with. Make sure to keep your eyes peeled for any new items follow @deciem on instagram for updates. Let me know what items you're curious to pick up. 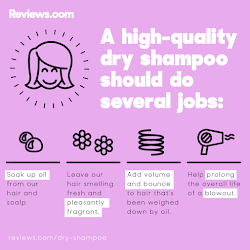 What Dry Shampoo Should I Buy? ?